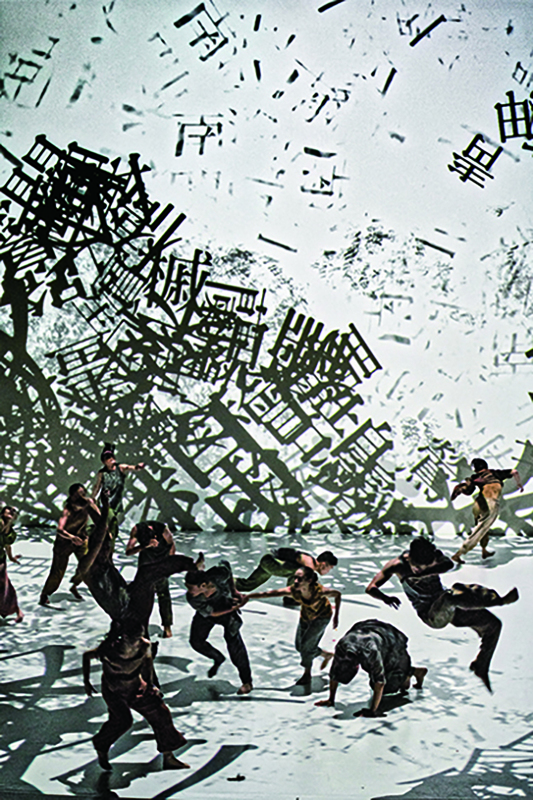 Cloud Gate Dance Theatre’s new production Formosa, presented at Sadler’s Wells, is also the last work choreographed by its founder Lin Hwai-min who has announced he will retire as artistic director in 2019. From its avant-garde beginnings in the 1970s, the company has occupied a unique position in Taiwan and internationally, distinctively merging diverse artistic and cultural influences into an extensive repertoire of works in which local traditions, myths or history acquire contemporary significance. In his work, Lin Hwai-min uses Taiwan as a source of inspiration to create imaginative microcosms that act as metaphors for the dynamics shaping geopolitics and societies more broadly. Such a correlation between micro- and macrocosm is also the underlying motif in this latest work, in which Taiwan itself is the protagonist (Ihla Formosa is the seventeenth century Portuguese name meaning ‘beautiful island’). Lin Hwai-min evokes its landscape of rice fields and oceans, rivers, valleys and towns through poetry, sound and movement that convey the expansive idea of cultures as ‘collective conditions of immersion in air, [water] and sign systems’. He achieves this synthesis by seamlessly imbuing the choreography with formal integrity and poetic vibrancy. The empty stage is like a three-dimensional plane of infinite possibilities delineated only by white light as if we are peering into an open box. The twenty-four dancers in loose costumes of pale blues, greens and orange-browns are both the embodiment of place and lore, and of the Chinese ideograms that represent them. The initial white emptiness gradually fills with projected typefaces giving form to an intangible scenery by Chou Tung-yen and Very Mainstream Studio. It is like a world in the process of being created that resonates with a soundscape of music, found sounds and recorded readings. Words, as the programme notes suggest, are the starting point for Formosa. We use words to name and document, to represent and give meaning to the environments in which we live, but words can also become blurred over time as the stories we tell give way to new ones. It is this potential to convey meaning and the sensory qualities of resonance, rhythm and the graphic character of words to which the choreographic movement responds, shifting fluidly from floor rotations to elevation and arched extensions in a constant gathering and dissipation of form that at points isfrozen in temporary stillness. Like the shape of a Chinese ideogram that contains within its abstract form the concept and action it refers to, Cloud Gate Dance Theatre’s distinctive dance vocabulary conveys in gestures and steps both aerial lightness and earthy robustness: the rhythm of seasons, the swaying of grass and leaves or the flowing of streams, the tapping of feet resounding like rain and falling bodies dropping with the mighty weight of stones shattered by an earthquake. The vibrant almost pastoral beginning teeming with activity and the unpredictable eruption of the elements acquires a more sinister quality in the second half of the performance. As we learn in an excerpt from Taiwanese poet Walis Nokan’s Pulling Back The Veil Of Silence, the flow of rivers is stopped by man’s fortifications: we see Huang Pei-hua as a solitary river increasingly surrounded by the menacing and aggressive clustering of the rest of the company. She dances her demise in what is a Sacre du Printempsfor our ecologically doomed times and the stage is increasingly filled with typefaces whose density makes them illegible: a collapse into incommunicability and violence. Fighting erupts and the dancers divide into two groups. Lin Hwai-min comments in the program notes, ‘There is a tradition of internal fighting on this island. But as I was working on the piece, I realised such conflict was everywhere. Taiwan is not unique… Look at what is happening everywhere. But I believe it has a universal appeal that is applicable to other countries.’ On stage, aggression and violence turn into disintegrating energies and a struggle for survival. The dancers fall to the floor; ideograms themselves fragment line by line until they dissolve into nothingness. Slowly one by one the dancers pull themselves up into a faltering motion that increasingly takes on the perpetual flow of waves that form and break, repeated in the concluding section by a film sequence of the ocean and a solitary figure who stands in a box of white light as at the beginning of the performance. ‘All things contrived are like a dream, illusion, bubble, shadow, and as a dewdrop or lightning. They should be regarded as such’, reads the Buddhist Diamond Sutra. Out of movement and light Formosacreates a world that is both dreamlike and illusionary, full of tumult and tenderness, a drop that contains an ever-changing ocean of possibilities.